Naija End Gooner: All We Are Saying, Give Us Arsenal! The boys have arrived in Beijing and were accorded another awesome reception from the Chinese fans. Oh! 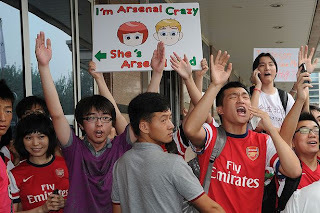 How they love this club in China. Makes me wonder what would have been if they had come to Nigeria as planned. The Malaysian and Chinese receptions would have paled in significance, wouldn't it, Nigerian Gunners? Yeah!!! I hear you roar, "ALL WE ARE SAYING, GIVE US ARSENAL". Yeah! You all know that tune and we will sing it until we are heard if they don't keep their word to come play here next summer. "We have a huge and loyal following in Africa, and we are sorry that the team will not be visiting this summer. However, we have a long-term commitment to Nigeria and we are already making plans for a visit next summer." Hopefully, the club will keep their word and we'll watch and cheer the team on our shores next summer. The game in China is between us and a familiar opponent from the premier league, Manchester City. It's a showpiece game like the one in Malaysia last Tuesday but I reckon we'll take it a bit more seriously than the game against Malaysia XI for pride's sake. The game is scheduled for Friday next at 12 noon at the famous Bird's Nest Stadium in Beijing. I'll let you know here and here when I confirm if it will be aired in Nigeria. However it goes anyway, not much significance should be given to the results because the boss is more interested in the workout value of these pre-season games than the results, and of course the Chinese fans will expect to be entertained. Having said that, I'd rather we were not at the receiving end of a hiding from City because we need the team to have a workout and the Chinese fans to be entertained. It's City we are talking about and the British press in particular will not let us live it down no matter how friendly the game may be. It has become fashionable to remind Arsenal how they need to spend more money especially when a chink is spotted in our amour. I really don't want to hear it. It was one of them days today and I couldn't find time to get in here earlier than now. Luckily there wasn't much more than unconfirmed rumours of Carzola heading our way amongst a few other rumours to report. I'll keep it short this night and hopefully I'll be much earlier tomorrow.